You finish your degree and being a woman of the post feminism era you maintain a professional career as well as a full-fledged household. It would all be perfectly well and desirable had this rise in responsibility not come hand in hand with ever increasing levels of stress and busy-ness. The results? Irritable temperaments, a constant feeling of fatigue and…spondylitis! This is a state of affairs a hefty proportion of working women would identify with and no this is not to make you feel worse about the choices you have made. On the contrary, it serves to bring you good news in the form of Club Prima Donna, a new section at Farzana Shakil Makeover Salon, which provides a peaceful and elegant atmosphere designed to cater for a full range of rejuvenating beauty treatments and massages. Their line of beauty and health care facilities will invariably leave you relaxed and recharged, both mentally and physically. From the impressive range of body massages, you can opt for any of a number of choices. The Aroma Therapy makes use of essential oils from plants, roots and herbs and the oil massage is guaranteed to rejuvenate your skin and leave you looking fresh and healthy. Next up is the Thai Body Massage, which works to reduce tension, increase blood circulation and soothe sore muscles without the application of oils. Moving on, we come to the Slimming Massage that uses a combination of creams and oils, which stimulate the metabolism of fat-containing tissues and cause the muscles to become firmer. Concentrating more on appearance is the Whole Body Scrub Massage that aims to get rid of dead skin cells and cleanse pores of accumulated dust and dirt. Also on offer is a foot massage called Reflexology that is perfect for working women who tend to be on their feet for extended periods of time. For treatment that is equally appearance enhancing as it is therapeutic, make sure you take full advantage of this opportunity to unwind your stress, give yourself a breather and do away with those monstrous back aches. 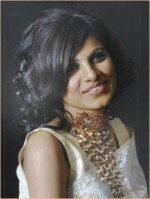 Be sure to stop over at Farzana Shakil's Makeover Salon at House #3/A, Road # 28(old), Dhanmondi. When it comes to working with local artisans and designers, Aranya's name makes top of the list. They have been working with weavers in Tangail and Thakurgaon for years, developing unique textures and blends equally attractive in colour or natural white. Their highly skilled weavers have since created a range of sophisticated patterns and colours suitable for casual as well as formal occasions. Natural fibres such as cotton, silk, khadi and endi yarns have been combined for dramatic borders and anchals, giving them a classic look that is timeless and traditional. The beauty of handloom lies in the innovative skills and design appreciation of the weaver. For it to be perfect there can be no conflicts in the mind of these weavers regarding design and style. And so far, the weavers working for Aranya have proved themselves to be among the most talented and dedicated. Although saris are their specialty, they definitely have much more to offer. There are a wide variety of shawls and wraps to choose from which may or may not be worn with saris, shalwar-kameez, or even men's punjabis during the gentle Bangladeshi winter. Aranya's Handloom Collection is a tribute to the rare skill of the country's artisans. Come winter and the fashion houses of the city are abuzz with activity. Styles change. Patterns change. Colours change. It is time to throw out the old lines and offer something new to the clients. This winter, Rang has pumped out its new line for the season. It has up on offer shawls for both men and women, which serve dual purposes- they are fashionable just as they are effective as warm clothing. Shawls with saris make a perfect Bengali winter beauty and for men shawls go well with almost anything anywhere- be it home or at work, with panjabi or lungi. Rang has in store a wide range of designs and materials in its collection. Khadi shawls from Comilla are particularly popular. You can also find saris, salwar kameez, panjabis, fatuas and T-shirts alongside mufflers, bedspreads and blankets. Drop by any of Rang's showrooms this winter for the best buys this season. Put cheese, butter, mustard, seasoning and vinegar in a heavy based pan and heat very gently until creamy. Spoon mixture onto the toast and sprinkle with pepper. Heat under a hot grill until browned. Serve as a tasty snack or supper dish. 1. Clean and scale the fish, wash thoroughly and dry with paper towels. Make several cuts into the flesh on each side of the fish - this will let the marinade get right in. 2. Melt a little butter or margarine in a pan and fry the almond slivers over medium heat. Keep tossing the almonds and as soon as they turn brown, remove them from the pan. Watch carefully as they tend to burn very easily and if that happens toss them away and start again - burnt almonds devalue the taste. 3. Mix the honey, grated ginger, lemon juice and soy sauce in a saucepan and gently heat just enough to turn the honey into liquid. 4. Using the pan in which the almonds were cooked, add a little more butter if necessary and cook the finely chopped shallots until they are softened. Add to the honey and soy mixture. 5. Place the fish into a shallow dish and pour the marinade (the honey, soy, ginger mixture) over the fish and leave for 15 minutes. 6. Rub some butter over pieces of aluminium foil large enough to completely wrap each fish. Sprinkle the toasted almonds over the fish and put some inside the cavity, pour over some more of the marinade. Wrap each fish securely and put into a 180 degree oven for 15 minutes. Shell, de-vein and wash the prawns, then thread on skewers, four to a skewer. Mix the rest of the ingredients in a non-metallic bowl and boil the prawns for two to four hours. Place a tablespoon of sawdust in the base of a box smoker directly above the heat source. Place the prawns on a wire rack and smoke for eight minutes. Serve on a bed of rice with the reserve marinade poured over. You can use a big wok as a smoker. Place the sawdust in the bottom of the wok and a wire rack over it. Smoke the prawns on the rack with the wok lid over it. It has not been long since Coffee World first opened in the city of gustatory connoisseurs. In a city where fast food stores, ice-cream parlours and beverage shops are at the peak of competition, Coffee World has survived. Even more so, it has gained an immense popularity. The opening of the 5th branch of Coffee World goes on to show just that. On November 18th, Saturday, Etcetera Bangladesh premiered this outlet in Dhanmondi, and alongside, introduced the first ever Bangladeshi outlet of Pizza Corner. For those in need of some back-story, Coffee World is a global franchise with almost 110 outlets in Asia. The ambience is welcoming enough, with amicable yet not overly bright lighting. There are chairs, as well as cozy sofas to help customers unwind. The atmosphere itself and the strong scent of brewing cappuccino encourage an order of coffee. Coffee World offers a comprehensive range of hot, iced and ice-blended coffee along with cakes, sandwiches and its famous waffles. Personally speaking, the Mocha Chip Frappe (with mocha chip frostings) and the Smoked Chicken Waffle Sandwich (with warm spongy waffles loaded with content) are to die for. The beverages are available in three distinct sizes -depending on the magnitude of your appetite. Still, there is one word of advice- go for the largest size (aka Supremo). This way, you can revel in the richness even after you are done with the meal, and are on your way home. Coming to Pizza Corner, the franchise “understands the difference between a good pizza and a great pizza”. It believes that great pizzas are “a way of life”. The special pizza dough is meticulously hand-stretched, and the ingredients are flown in from France. And it goes without mentioning, that the pizzas are loaded with Mozzarella cheese and fresh garden-grown vegetables. Both vegetarian and non-veg pizzas are available. Moreover, it allows you to create your own pizzas by providing a menu with a wide number of options. For a cheese-dripping, pepperoni-munching experience, this is a place to go. The very demanding and demanded BTEC Diploma course has arrived in Dhaka. November 15 2006 saw the signing of a Memorandum of Understanding between Persona and Edexcel International which took place at the Aristocrat Resturant, Gulshan-1, Dhaka. The course was launched by “Persona Institute of Beauty and Lifestyle”- the pioneering beauty and lifestyle institute in Bangladesh. This course, it is said, is very effective in developing a skilled workforce that is of utmost importance in the global beauty industry today. Beauty expert Kaniz Almas is very hopeful about the success of this course. Students who enroll will be able to transfer their credits to universities in 150 countries around the world. In the near future, Persona Institute plans to launch this diploma program in renowned universities and institutes in UK, France, Italy and the US.